This elegant villa in the Dutch region of Overijssel, can accomodate up to eight people. The villa has four bedrooms, three bedrooms are equipped with a comfortable double bed and one room with a bunk bed. All bedrooms are very spacious and equipped with a modern TV. The living room boasts high-quality equipment. Here are next to a fireplace, a game console, a large TV with DVD player. The fully-equipped kitchen completes the interior of the stylish villa. 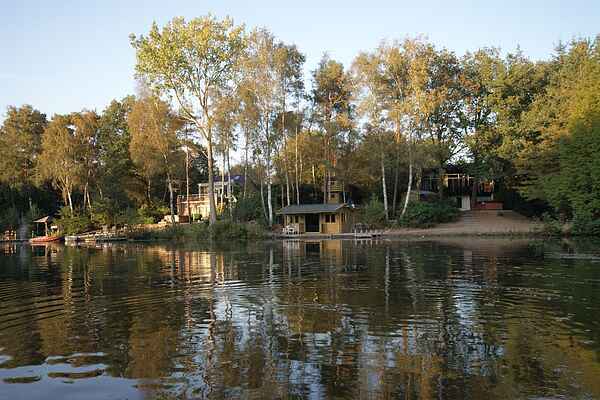 The villa Overijssel is located on a small lake. A large garden plot invites you to linger and relax. Here, children feel right at home. Various garden furniture and a grill are available as well as a private fishing pier. In addition, the plot has a log cabin where you' ll find a ping pong table, especially for rainy days. In addition, there is a contemporary Finnish sauna. The villa Overijssel has everything you need for a quiet, relaxing holiday.